Acai berries have more antioxidants than nearly all other foods with high levels of these helpful compounds, including red wine, blueberries, blackberries, and raspberries. The antioxidants found in acai fruits are called anthocyanins and flavonoids. Cacao beans contain even more antioxidants than acai. The high level of flavonoids in cacao is one of the main reasons why it’s so nutritious. Most of the other ingredients in this recipe are also high in antioxidants, in particular goji berries and bee pollen. All the credit for this divine concoction goes to fellow smoothie expert, Ana. During our email exchanges about smoothies and all things healthy she’s been kind enough to share some of her stellar recipes with me, and you. Enjoy! 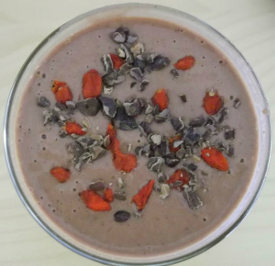 I would love to know if you try this antioxidant acai cacao superfood smoothie and how you liked it. Please leave a comment below. Happy Blending! What would be required of us to allow me to use this recipe for commercial resale? My permission :) Go right ahead, Don. If you can attribute the recipe to me or my site I would appreciate it. Hi Ryan – instead of acai powder can I substitute for fresh berries and what quantity? Sure you can use fresh berries if you have access to them, Karen. I’d start with 1/4 cup and work up to half a cup. They’re pretty potent.